Helen Davies QC was Called in 1991 and took silk in 2008. She practises in commercial, EU and competition law from Brick Court Chambers, where she is the Joint Head of Chambers. She has been a top ranked practitioner in her fields for many years, and has appeared at every level in commercial litigation, including the Supreme Court and CJEU. She also sits as an arbitrator domestically and internationally. She was nominated by Chambers & Partners for Competition Silk of the Year 2018, and in 2019 won Commercial Litigation Silk of the Year in the Legal 500 UK Bar Awards. Sonali Naik QC was Called in 1991 and took silk in 2018. She practises public law from Garden Court Chambers, with a particular focus on immigration, asylum and nationality law. She has appeared in several landmark immigration cases before the Supreme Court in recent years. She is a board member of Liberty, a trustee of Freedom from Torture, a Council member of Justice, former Chair of the Joint Council for the Welfare of Immigrants ("JCWI") and a current trustee of the Immigrants' Aid Trust, as well as a Patron of Clean Break Theatre Company working with women ex-offenders. She was named BSN Lawyer of the Year at the UK Legal Diversity Awards 2018. Jennifer Robinson was Called in 2016, having previously practised for ten years at the Bar of New South Wales, Australia. She practises in media, public and international law from Doughty Street Chambers. Recent work has included: advising Julian Assange and WikiLeaks on legal issues related to publication, asylum, extradition and international law, and acting for a group of NGOs in challenging the cross-jurisdictional impact of 'the right to be forgotten' in Google v CNIL before the European Court of Justice. Jennifer serves as a trustee of Article 19 and the Bureau for Investigative Journalism, as well as on the advisory board of the European Center for Constitutional and Human Rights. She is a founding board member of the Grata Fund, Australia’s first independent public interest litigation fund, which has supported key strategic human rights cases. 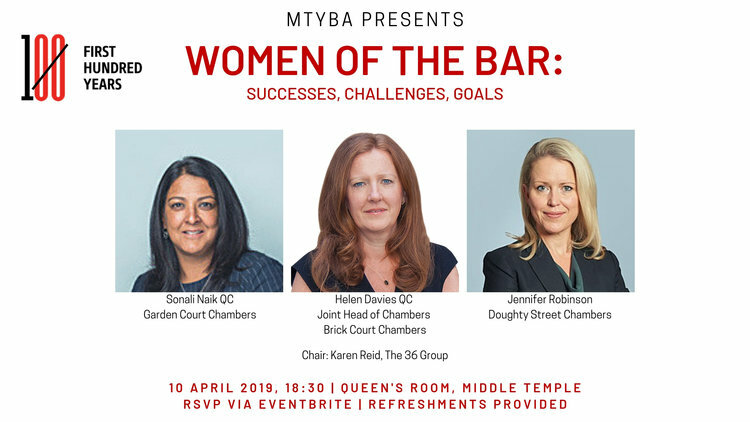 The panel will be chaired by Karen Reid, a barrister at The 36 Group, and former President of MTYBA. Prior to the panel discussion there will be a short presentation from the First 100 Years project. The panel discussion will be followed by Q&A and networking. Refreshments will be available throughout the event.